Head and neck cancers most often appear in the squamous cells, which line areas like the throat, mouth, and nose, sometimes causing face and neck disfiguration and impacting speech, sight and sense of smell. The greatest risk factors for these cancers include alcohol and tobacco use, including the use of smokeless tobacco. Another risk factor is HPV (human papillomavirus) infection. Men are more likely than women to be diagnosed with head and neck cancer, and people over the age of 40 are at higher risk. Poor nutrition, inadequate oral and dental hygiene, or a weakened immune system can also increase a person’s risk. Just as with brain and eye cancers, vulnerable, critical tissues and structures usually surround tumors that form in these regions, including the spinal cord and jawbone. As a result, they are prone to inadvertently receive unnecessary radiation exposure when traditional radiation treatment methods are used. If you’re looking for throat cancer treatment, or any head or neck cancer treatment, Provision is here to help. 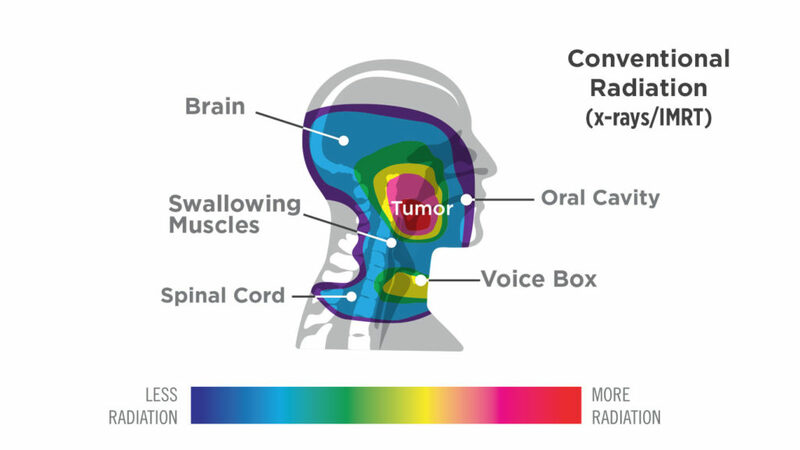 For more information for patients considering proton therapy for head and neck cancer treatment. A physician may recommend a physical examination in which the oral and nasal cavities, neck, throat, and tongue are inspected using a small mirror and lights and the neck, lips, gums and cheeks are inspected for the presence of lumps. A biopsy, in which tissue is removed and checked for cancer, may be used as well, along with x-rays, CT scans or magnetic resonance imagining (MRI). 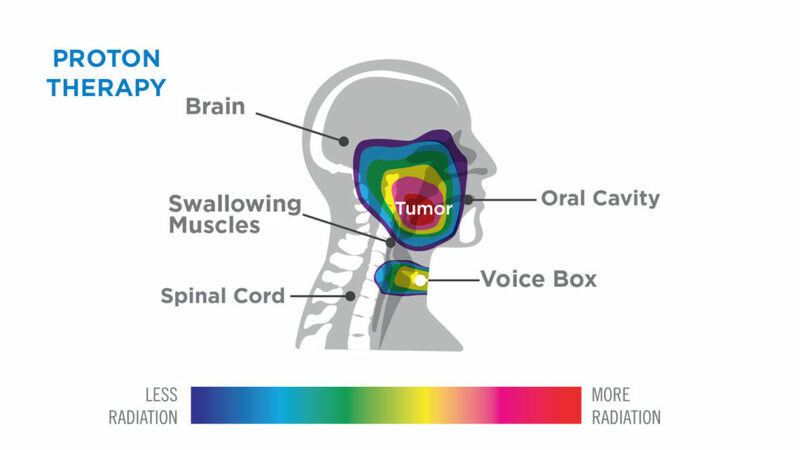 Proton therapy allows specialists to target and control the areas in which protons are emitted into the body and release their energy, increasing the radiation’s effectiveness while decreasing damage to the structures surrounding the treatment area. Patients will be at a lower risk for many negative side effects, including dry mouth and bone injury. Depending on the size of the tumor, a combination of proton and surgical therapy methods may be used for treatment.